Sometimes, I use a jar of sauce from the store, sometimes I make a simple tomato sauce, letting it simmer while I dredge and fry the eggplant. I always try to have enough to top my slices with more sauce. Slice eggplant into 1/4″ slices, sprinkle liberally with salt and arrange in a colander for 30 minutes. Pat dry. 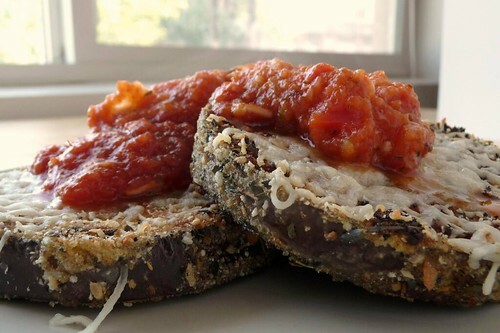 Dredge each slice of eggplant into flour, then egg, then bread crumbs. In a large skillet over medium-high heat, heat 3 tbsp oil. Fry eggplant slices in a single layer (you will need to do them in batches) until golden brown, turning once. Remove and drain on a paper towel. Add additional oil as necessary for each subsequent batch of eggplant. In a 13×9 or two 8×8 baking dishes, spread tomato sauce then layer the eggplant on top. (You will probably have to overlap some of them to get them to fit.) Sprinkle on cheeses. Bake at 425F/220C for 15 minutes until the cheese is melted and the sauce is bubbling. Top with more sauce if desired. This entry was posted in american, gluten-free, italian, recipes, untranslated, vegetable, vegetarian. Bookmark the permalink.